Federal courts have now found that the state’s voter-ID law and redistricting maps purposefully targeted black and Latino voters. Voters wait in line to cast their Super Tuesday ballots at a polling station located at the University Co-op in Austin, Texas, on Tuesday, March 1, 2016. On Friday night, a federal district court in Texas issued a bombshell opinion, ruling that three of Texas’s congressional districts were drawn to discriminate against black and Hispanic voters. The redistricting maps drafted by Texas Republicans after the 2010 census “intentionally diluted minority voting strength in order to gain partisan advantage,” wrote Judges Xavier Rodriguez and Orlando Garcia of the Western District of Texas. The court found that Texas Republicans unnecessarily concentrated minority voters in certain districts to reduce their influence statewide while diluting minority representation in other districts, specifically naming Republican-held seats in South and Southwest Texas (CD 23 & 27) and a Democratic-held seat based in Austin (CD 35). This means Texas could gain at least two more Latino-majority congressional seats, which should favor Democrats. More importantly, the opinion paves the way for Texas to once again have to approve its voting changes with the federal government under the Voting Rights Act for a period of time. Only by reading the voluminous lawsuits filed against the state can one appreciate just how creative Texas Republicans had to be to so successfully dilute and suppress the state’s minority vote. According to a lawsuit filed by a host of civil rights groups, “even though Whites’ share of the population declined from 52 percent to 45 percent, they remain the majority in 70 percent of Congressional Districts.” To cite just one of many examples: in the Dallas-Fort Worth area, the Hispanic population increased by 440,898, the African-American population grew by 152,825 and the white population fell by 156,742. Yet white Republicans, a minority in the metropolis, control four of five Congressional seats. Despite declining in population, white Republicans managed to pick up two Congressional seats in the Dallas and Houston areas. In fact, whites are the minority in the state’s five largest counties but control twelve of nineteen Congressional districts. Texas’s voter-ID law, which was passed at the same time as the redistricting maps, was also judged to be intentionally discriminatory by a federal court in October 2014. As the federal court noted, “the Texas Legislature enacted its 2011 redistricting plans in the context of strong racial tension and heated debate about Latinos, Spanish-speaking people, undocumented immigration and sanctuary cities, and the contentious voter ID law.” Federal courts initially blocked both the voter-ID law and the redistricting maps in 2012, but the decisions were voided in June 2013 when the Supreme Court gutted the Voting Rights Act. This is a potentially big victory for voting rights, but in truth neither of these laws should have seen the light of day after the courts initially blocked them. 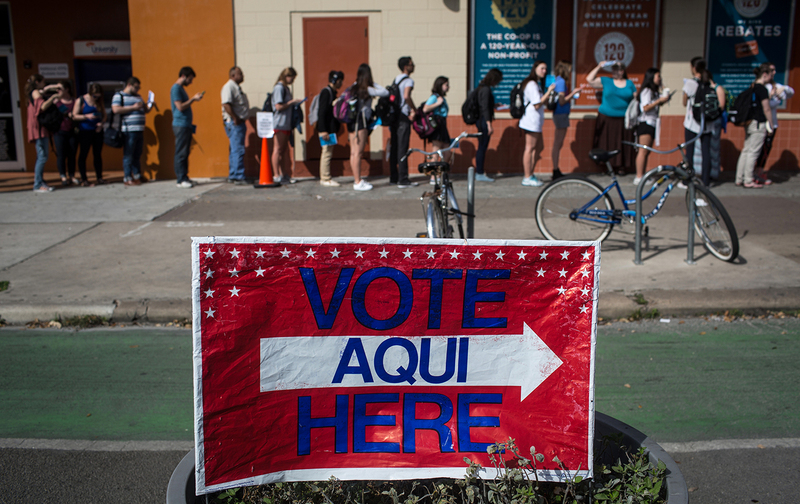 Texas’s elections have been tainted since the Supreme Court weakened the Voting Rights Act. The evidence of intentional discrimination in these opinions shows why it’s so important for Congress to restore the law. Listen to Ari Berman discuss voting restrictions on the Start Making Sense podcast.